Sounds like you are ready! Good luck with your first marathon! And have fun! In the name of the Loop, of the Dave and of the holy Bacon...My last bloop was.....holy sh!t...I don't know...weeks? months ago? As a martial artist and runner, and father to two little girls, I think this is awesome. Also a bit sad that you have to deal with this and all the harassment on your runs over the years. I hope you can quickly figure out your "hambutt" problems and get back to running soon! And Happy New Year! You seem to be at every Loopfest! Good times. If I went all the way to the east coast, I think I'd have to run 50 miles to get my money'a worth! But you're right about the people and the magic. The race is just an excuse to hang out with "old friends". Congrats on the solid race! You've always been such a positive voice in the Loop. And even when you're not running, you'll always be a runner at heart. Does a musician ever stop being a musician? Always good to read a blog from you! I ran on the strip a couple years ago. All those stairs are maddening, but it beats running on the hotel treadmill! Good luck on your 1st marathon! Sounds like your training is going great! California International Marathon: "God, please make us brave and strong"
What an amazing race! A 2:47 PR blows my mind! The courage to go after that "pie in the sky" dream and to come so close is so inspiring! I really hope you get it someday soon. Congratulations on a great race! Congrats on the Sub-3! That is an awesome accomplishment! Great job, man! I wish I could've been there! So many cool loopsters running the race this year! Too funny about the KT Tape! It's always nice to hang out with Loopsters. One of these days, I'll have to join you guys on the East Coast... Glad your hammy cooperated for your race! Good job on the marathon finish, Dave, despite the wonky hamstring. Sounds like another great Loopfest! "First run in 1905, the Dipsea is the oldest trail race in America. It is run every year on the second Sunday in June. The scenic 7.4 mile course from Mill Valley to Stinson Beach is considered to be one of the most beautiful courses in the world. The stairs and steep trails make it a grueling and treacherous race. And its unique handicapping system has made winners of men and women of all ages." (http://www.dipsea.org/) The Quad Dipsea is a bit easier to get into, but still sells out pretty quickly every year (4 times the fun of the Dipsea?). This year was the 34th running of the Quad Dipsea! This was my second attempt at this race. I started this race a few years ago, only to sprain my ankle and drop after only 7 miles. So there was unfinished business to attend to. My goal was to just finish the race in the 8.5 hours we are given for an official finish. Eight and a half hours for only 28.5 miles sounds pretty easy, doesn't it? The 9200 feet of elevation gain makes things just a tad more interesting... Th The course is beautiful, despite seeing the same sections 4 times! I was having a wonderful time in the first half. I was running well and climbing well. I even blew through a couple aid stations! I got through the first half in 3:28, but I already knew that I was going to slow down in the second half. I was running well, but my climbing legs were woefully under-trained. My climbing grew slower and slower as the race went on. My legs started to cramp and hurt on the steep climbs. I was officially in survival mode, despite being able to run on the descents. On the last lap, I was scared I wasn't going to make it. The climbs hurt, and I had to take breaks going up just to keep my heart rate down. I kept telling myself to take one step at a time. I was still able to drink my Tailwind Mix in my handheld bottle, but nothing was easy at this point. One of the great things about a race like this is the people. Everywhere you go, people are cheering you on. And you get to see everyone racing on the out-and-back course, twice! When you're hurting and suffering, you can take comfort in the fact that you are not alone. You can see pain etched in the faces of many of your fellow runners. It's a reminder to keep fighting, to dig down deep and to keep moving despite the pain. Somewhere in those final miles, I must have found my limit, and ran right past it. "You must do what you don't think you can do." Isn't that one of the reasons why we run ultras? To find the limits we place on ourselves (mentally), and then surpass them? It's a great feeling! Of course, I would've had a better limit if I had trained better! Oh well. Life goes on. I finished the race in 237th place out of 300 finishers, in 7 hours and 53 minutes. The shwag was great (a finisher's patagonia jacket and long sleeve shirt)! I felt sick for hours after the race (even after throwing up). My legs randomly seized up through the night. It was all worth it, because I didn't give up and I finished. I didn't win the race. I just owned it (my own race, that is). Find your limit. Pass it. And don't look back. Looks like a great turkey trot! It's on trails too! Maybe we can get Mo to write a blog one of these days. She is such a great artist - maybe she can paint a blog! Rehoboth 13.1 RR: I unintentionally sandbagged my goal. Congrats on such a well run race! Negative splits are not easy to pull off in a race. Great job! Congrats on the age group win! Good to see you in the new Loop! Yes, it is a mere 50K! Sign up! The Overlook 50K was created by Ann Trason and is run mostly on the Western States course. Most of you know that I hired Ann as my coach a few years ago when I trained and ran my first Western States race. Despite the painful DNF (did not finish) there, I had a wonderful journey, highlighted by Ann Trason's inspirational tutelage. I came into this race pathetically under-trained, with no long trail runs for about 4 months. Still, I was hopeful that I could fake my way to a finish and get a long training run in the process. Surprisingly, I ran really well for about 27 miles! Then it got hot and hilly. I became mildly dehydrated and my body started to protest with a series of cramping and pain. The last 4 miles were slow and tough. But somehow, I managed to run-walk-crawl to the finish line in 6 hours and 7 minutes. Good for 49th place out of 139 finishers! I had a great time! Everyone is wearing tutus at this river crossing aid station! The river is both refreshing and a shock to the system! Laura Matz, in the distance... The views are breathtaking everywhere you turn! It's a waterfall! Gordy Ainsleigh! He is local hero/legend, and everyone around here loves him. He always gets a nice ovation and cheer at the finish! 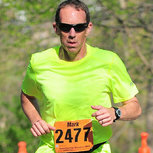 Other notes: One the mantras I used in my first 27 miles was, "Run like you're in 2nd place." I was thinking about my 2nd place finish at the Mokelumne River 50K when I was better trained and the fast kids were doing a different race. I ran like I was being chased. I ran like I was protecting a lead. And I passed a lot of people after going very easy in the first 10 miles. And I really thought I could keep it up right to the finish.